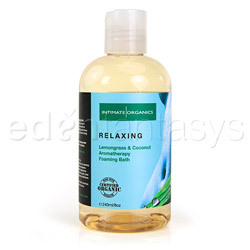 Intimate Organics Relaxing cleansing gel not only smells great but leaves your skin feeling soft and smooth too. Made from all natural ingredients that you can feel good about, you might just find one or more health, skin or physical benefits from incorporating it into your daily cleansing ritual. Paraben-free, multiple aromatherapy properties, not tested on animals, smells great. This bathing gel is an excellent choice for those who want a shower gel that smells great and is made from safe, natural ingredients that weren't tested on animals. The fact that it smells nice and has multiple aroma-therapeutic benefits adds to its appeal. I found Relaxing Cleansing Gel a little thicker than other shower gels I've tried. Its similar in thickness to a thick shampoo. Its thin enough to pour easily but thick enough to feel luxurious. You can pour some on a washcloth then run water over it without washing off most of it. It smells wonderful. When it first arrived, I had forgotten what I ordered and didn't have my glasses on, so I spent some time smelling it to try to figure out what was inside it. I could detect the lemony component of it, but failed to identify the other scented ingredient. After I read that the scented components are Lemongrass and Coconut, I can see that its Coconut that is the predominant scent. How could I have missed that distinctive scent? It seems that with my incredible sense of smell that I did not miss my calling in the perfume industry. This gel lathers very well. Using approximately a teaspoon of gel on a body scrubber with a little water produced enough suds to clean my entire body. Using it is so much more pleasant than bar soap. Relaxing Cleansing Gel arrived in simple packaging - just the bottle itself inside a plastic bag. Thank goodness for that bag. A small amount of gel had leaked out. I can't tell the source of the leak. It may have had something to do with it sitting in a hot mailbox all afternoon. This is the full list of every benefit I could find. Truly this is an amazing product if it can address even half of issues on this list. It should be noted that lemongrass can be a skin irritant for those with sensitive skin. I have sensitive skin, however I didn't find this cleansing gel to be irritating at all. It don't believe coconut was added as an aromatherapy ingredient. At least I was not able to find much information about its use in that capacity. I did find a reference to the fact that it helps transport other oils into the skin and can be used to treat itching, dry or sensitive skin. Relaxing Cleansing gel contains Aloe extracts, so your skin will feel moisturized as well as clean. Relaxing gel arrived on a day when I not only found it inside my mailbox, but also a large pile of horse manure in my driveway. Shoveling and wheeling that to the garden was not only exhausting, but left me more in need of a shower than ever. Relaxing gel performed admirably, leaving me clean enough that no one would guess what I had been covered in moments before. I'm not terribly aware of the scent anymore after using it multiple times. I'm not sure if the reported aromatherapy benefits still happen after you lose your sensitivity to the smell. I also don't believe the scent lingers on your skin after its rinsed off. My skin felt good afterwards. But forget my skin. I felt good. LOL I love your last line. I'm a bit confused though. Did you rate it 4 stars but no cons because of your last few sentences on the scent and not knowing about the aromatherapy? I love Intimate Organics so you totally got me adding this to the wishlist! Your list of good properties was very interesting also. Oh, this sounds soooo yummy! This type of scent is right up my alley. The list of benefits was very interesting. Very nice review on this. I only give something 5 stars if I really felt it was exceptional. So I guess I'm saying this was very good but not exceptional. Maybe that's not fair because I'm not sure what would make a shower gel exceptional. Perhaps if I noticed that the aromatherapy benefits definitely worked for me. Thank you for viewing Relaxing cleansing gel – sensual bath review page!